It’s September—back to school month! But, for moms of college students, particularly freshmen (or moms whose kids have joined the military), “back-to-school” has a different spin on it. Instead of seeing their children off to high school in the morning and anticipating their return at the end of the day, a lot of moms in my circle of friends (myself included) are right now saying “good-bye” to their kids for what might be months on end. It’s exciting for the kids—who are off on a new adventure, and the start of the rest of their life. But it doesn’t always seem as exciting for Mom and Dad, who are left with an empty spot at the dinner table and a person missing from their household. I have heard from a lot of moms in particular lately who are really struggling with this. My husband is the youngest of six children, and I remember my late mother-in-law having a tough time when he left for Marine Corps boot camp at age 18. In his haste, he forgot some record albums, leaving them scattered on the floor by the stereo, and a pair of his shoes in the middle of the family room floor. I think she left them there for at least three months! Bless her heart; she wasn’t quite ready to admit her nest was really empty. I have launched four of my five children (most recently Tim, who is a freshman at Washington State University this year), so I understand this! I thought about my mother-in-law when it took me a couple of weeks after he left to go into Tim’s room and change the sheets on his bed, clean out his clutter, and make the room neat enough to use as a guest room when the occasion arises. I could relate a bit to how she must have felt, especially considering that Doug was her last to leave the nest. 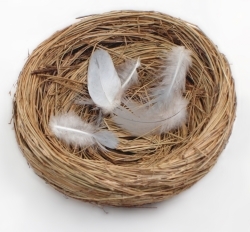 There are a lot of ways we moms can react to our emptying nest. We can celebrate the season and grow joyfully into our new role as parents of adult children, or we can mourn the loss of the old season and try to hang on to the little people our children used to be—and to our role as their mommies. I see women go both ways. Having a child leave home can produce feelings of sadness in both dads and moms, but it’s generally moms who feel it most. More often than not (and I realize there are exceptions) it is mothers who are the front line nurturers. Whether we work outside the home or not, we still tend to be the primary day-to-day caregivers in the first 18 years. Because of this, we are the ones who often experience the strongest sense of loss. Find some positives about the new situation and actively take advantage of them. Do you now have an empty bedroom you can redecorate and turn into another kind of useful space? Do you have more time in your schedule now that you can use to go back to school, start or resurrect a career, or volunteer? Build new friendships or renew old ones. The ability to spend more time with friends is a great benefit of your transition from full-time parent to parent-with-kids-launched. DON’T inundate your child with calls, texts, or Facebook messages. And, don’t let yourself feel the loss all over again if your child fails to reply as frequently as he or she once did to your calls or texts. DO schedule regular phone or Skype calls (decide these in advance). Treat his or her time with respect, as you would any other adult in your life. Revisit, or maybe learn for the first time, the power of prayer. When you are no longer the one caring for, reminding, protecting, and encouraging your now-adult child on a daily basis, you can entrust them to the hands of One who can. I believe prayer is the biggest and best thing we can do for our kids … to put them daily before God and ask for His love, wisdom, direction, and protection over their lives. I tell Hillary, our youngest, how great it’s going to be for her this year as an only child, because now she will have her parents’ undivided attention, to focus on her every need (and every move). So, why does she run screaming from the room when I tell her that? How have you handled “the launch?” What has been your experience? Please share your stories and encouragement; there are other moms who would like to hear from you! In late October, LifeSmart Publishing will be releasing its new book, Parenting for the Launch: Raising Teens to Succeed in the Real World, co-authored by Dennis Trittin and myself. This work is in response to the plea from parents, business leaders, and educators for better-prepared and responsible young leaders. We need your help to make this cause a reality! That’s why we’re inviting our friends, family, and influential leaders to join us in creating a special “Launch Team” for this book. This will be a group of people who are willing to take on the role of ambassadors and help us get the word out about our mission and book. A free, electronic PDF review copy of the book manuscript in advance of the publication date. The intrinsic reward of knowing that you’re investing in stronger parenting and a better-prepared younger generation. Share ideas and brainstorm additional ways we might further expose the book to an even greater audience. All ideas are welcome! Please let us know if you are interested in being part of our Launch Team. You can let us know by sending us a direct message via Facebook or emailing at arlynjlawrence@gmail.com. Thank you in advance for your consideration, support, and ambassadorship! It’s been two and a half years since the release of What I Wish I Knew at 18 and, oh what an amazing time it’s been! We could never have envisioned the success and impact it has had. We have been humbled and awed as the book and its accompanying course have made their way into homes, schools, mentor programs, and around the world. One of the surprising responses to What I Wish I Knew at 18 has been the resounding plea from parents, educators, businesses, mentor and faith organizations, and at-risk youth programs: Please write a book for parents! Here’s why. Colleges and employers report that an alarming percentage of today’s high school graduates are ill equipped to handle the pressures and responsibilities of the real world. As our world is becoming more competitive, kids are often lacking the personal skills and qualities to succeed. The economic climate and job market are especially challenging these days, not to mention the cultural climate that offers innumerable distractions and potential de-railers that most of us never experienced (or even imagined!). 1. Have we covered the bases? 2. How will our relationship change? I collaborated on this project with Dennis (author of What I Wish I Knew at 18) because we firmly believe agree that young adults today need more than head knowledge. They need a solid, comprehensive leadership foundation that will support them and enable them to make key decisions in these crucial years and beyond. This includes having a purposeful life perspective, solid character, strong personal disciplines, the ability to develop healthy relationships, career smarts, financial management skills, and the capacity to overcome adversity. We believe, along with our spouses, that the first place this training needs to happen is in the home. Parents have a unique role in preparing their children for a successful launch to the real world. And, while there are many excellent parenting books out there, many focus on behavior and discipline without offering the complete picture of life readiness. Parenting for the Launch is expected to be released in late October, 2013. Please help us grow our circle by “liking” our FB page and following us on Twitter! Help us spread the word by joining our Launch Team and sharing Parenting for the Launch with your friends, family, and associates. And if you’re not already on our email newsletter, you can sign up here.